Stephanie and Tyler held their ceremony and reception at Wolf Mountain Vineyards in Dahlonega, GA. A perfect backdrop and inspiration for their rustic vineyard nuptials. Stephanie and I met in college. We played soccer together and were the best of friends. From the first time I met Tyler, I knew right away that he was the perfect match for Steph. I remember the day I heard the news of their engagement. I was ecstatic! But when this sweet couple asked me to make the cake for their big day I was flattered. Going through the whole process with them was fun, from the cake tastings to dreaming up this gorgeous wine-inspired design. I created a specialty 3-tier lemon cake with a fresh raspberry filling, and on the outside buttercream vines winding around. Amy and Jeremy were one of the more easy going couples I've worked with, yet had one of the most exciting and unique themes. Amy is a drag car racer and her groom races circle track. The bride had models cars made to look just like the ones they race, right down to the numbers and decals. This cake was so much fun to make with its spectator stands, officials tower and banking dirt track all made out of cake and fondant! The bride's mom even saved the officials tower for the couple to eat on their anniversary. Lauren was a friend from college whom I spent a summer abroad in Ireland with. She is the epitome of a sweet southern belle and her groom Jeff was her perfect match. They married in a gorgeous venue nestled in the woods of Statesboro, Ga. The couple decided on a soft elegant wedding cake with hints of blush, ivory, and gold (the couple's new new last name!) Lauren even surprised her groom, a huge Bama fan, with a red velvet grooms cake - the perfect shade of crimson! Stacey (a cousin of mine) and Jason live in Fort Worth, TX. 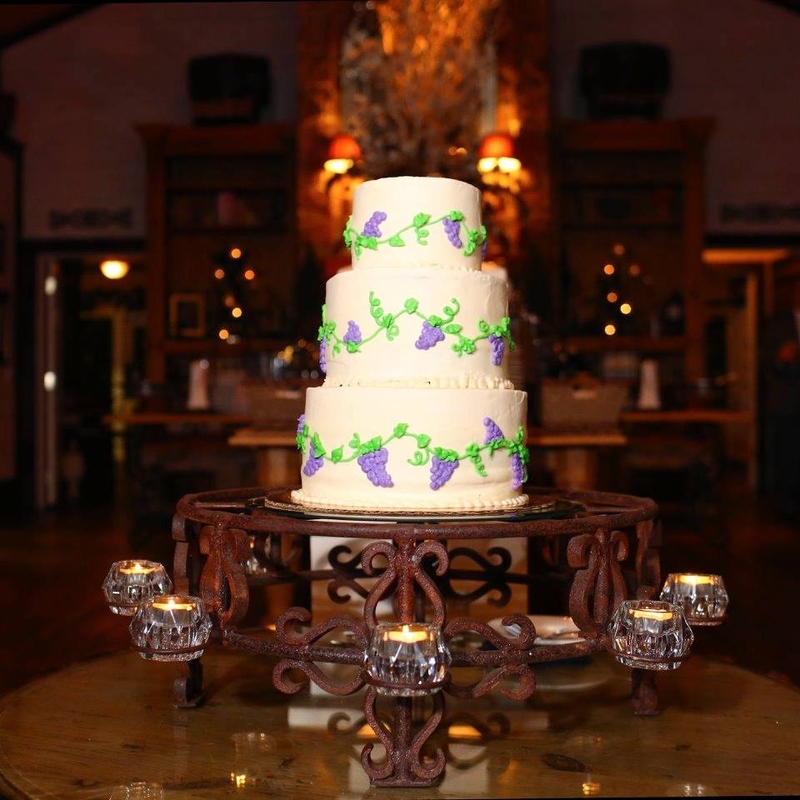 They opted for a small intimate wedding on a gorgeous Texan ranch, longhorns and all. The couple chose a rustic, simple 3-tiered cake layered with both chocolate and “chocolate chip cookie dough” flavored cakes. The birch tree carving of their initials on the middle tier is one of my favorite designs on the cake. Stacey knew she wanted to do a groom’s cake for Jason but wasn’t quite sure how since his favorite sweet treat is donuts. I created a gigantic “old fashioned cake donut” cake as well as a small batch of them freshly fried. A popular tradition in our family, and something Stacey knew she had to have at the wedding was a cookie table. The idea behind a cookie table is that family members bake batches of their own favorite cookies, set them out on a table at the reception, and then have guests take them home in “doggy” bags at the end of the night as their wedding favors. Stacey chose to have more than just cookies and wanted desserts that carried on the “Texas ranch” theme – so cowboy hats, horseshoes, boots, etc. They also had to include chocolate since that is something both her and Jason love! The menu included: Texas-shaped sugar cookies, old fashioned donuts, chewy chocolate brownies, s'mores pops, chocolate cowboy boot pops, peanut butter and chocolate cowboy hats, white chocolate chip cookies, and cream cheese filled pumpkin snickerdoodles. Jimmy, another cousin of mine, and his bride Marlana were married onHilton Head Island, SC. For Jimmy this place was a summer home away from home growing up. For Marlana, a Carolina girl, the beach was her happy place. I saw it very fitting they had their wedding on the island with a private ceremony on the beach. The cake reflected their love for the sand and the sea with blue buttercream icing and white chocolate seashells and starfish. The cake and cupcakes were chocolate flavored with a rich chocolate ganache filling. Making the cakes were fun; I even had some help decorating from Jimmy's little nephews. The whole event was a family affair with great food and good laughs.